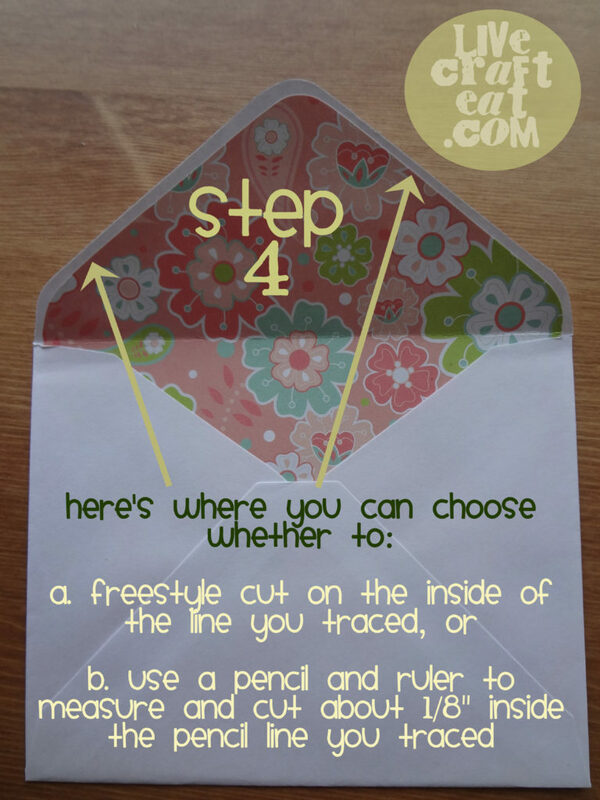 lining envelopes is one of those things that seems so simple but it can make such a big impact. opening a plain, white envelope versus opening one that’s been lined with colored or patterned paper can make all the difference. 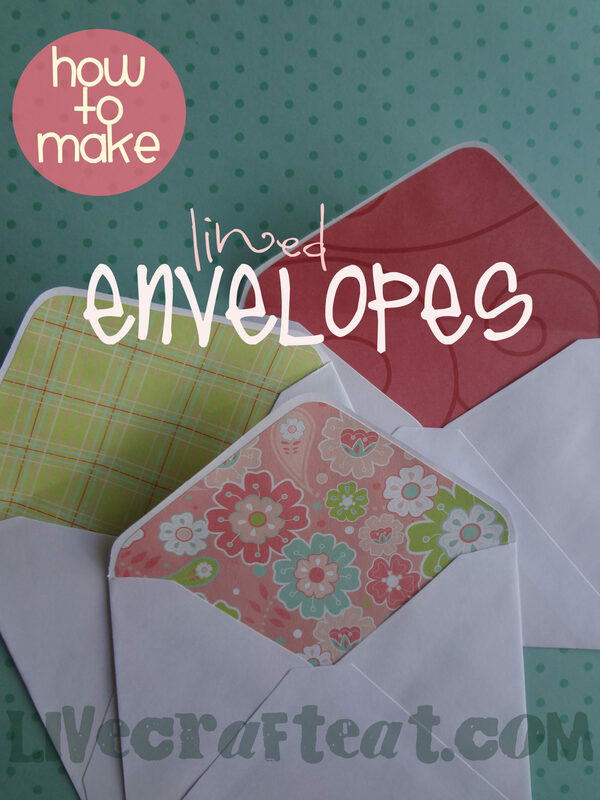 and when you see how fast and easy lining an envelope can be, you’ll be making them every time you send correspondence. the first thing you need to do is measure across your envelope. 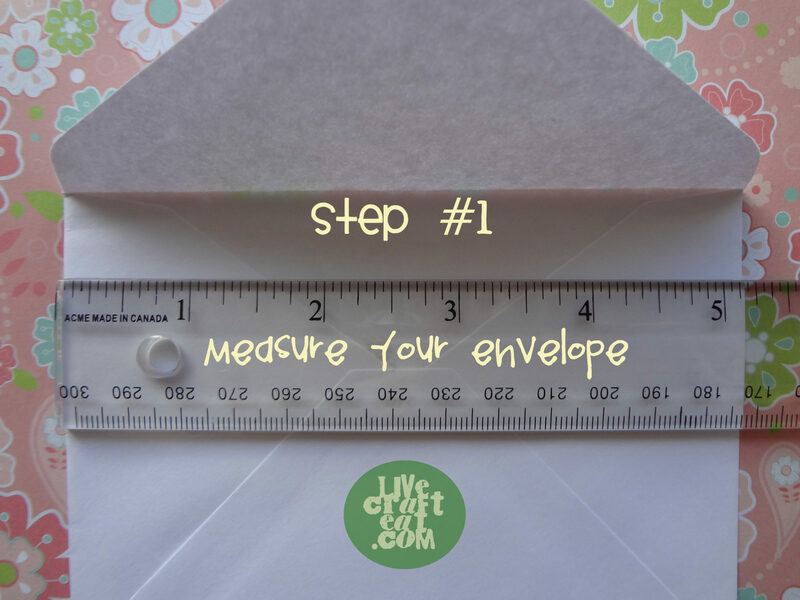 since all envelopes are different shapes and sizes, your measurement will be different from mine. 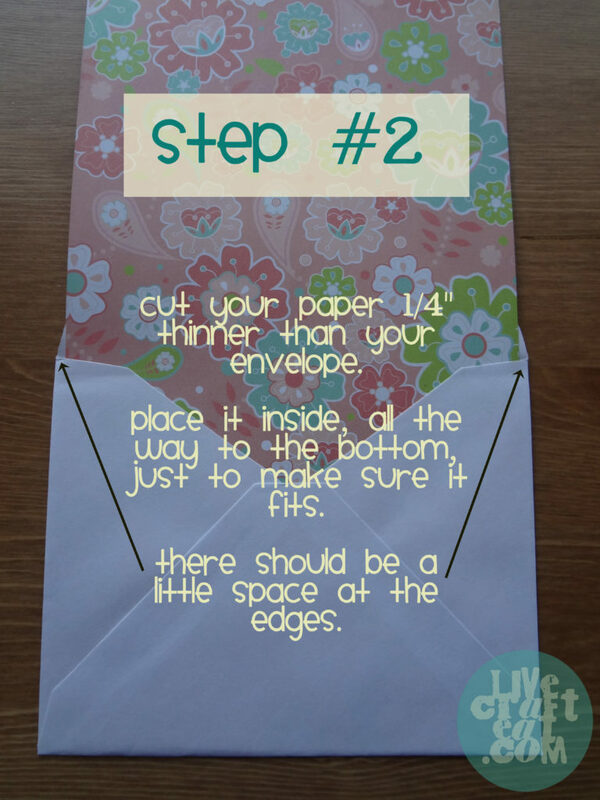 but one thing that will be the same, is that you’ll need to trim your paper 1/4″ from the edge of your envelope. make sure it fits by sliding the patterned paper into the envelope. you should have a little wiggle room on either side. 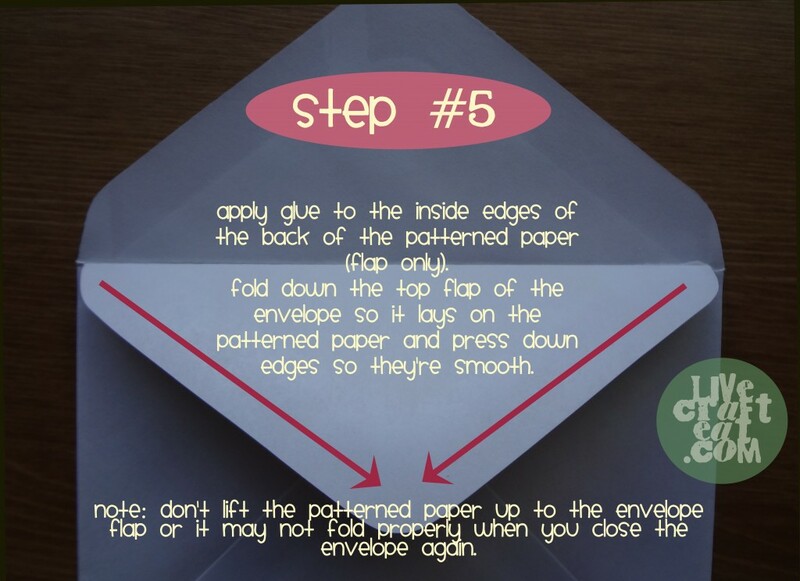 next, you’ll need to fold over the patterned paper (just fold the envelope closed, and since the patterned paper is inside it’ll fold in the right spot). fold down the envelope flap and trace it onto the back of the patterned paper. from here, you use the pencil line to either free-style cut with scissors about an 1/8″ – 1/4″ inside the line, or you can use a pencil and ruler to make a more precise measurement and to draw straight lines to cut inside the traced line you just drew. lined envelopes are perfect for every occasion. different papers will give you different looks and styles (ie. use red and green for christmas, gold for more formal things, pastels for baby shower invites, etc.). these are perfect for handmade wedding invitations or save-the-dates (and any kind of invitation, actually); little notes of any kind; valentines; christmas cards; your regular stationery…. it is so fun to make and to receive these lined envelopes. use your paper choice to coordinate and make your own stationery, too. when you spend a little extra time (and by little, i mean 1 minute – literally), you are sure to impress and put a smile on any recipient’s face. These are adorable! Can’t wait to make these! thanks! let me know how it goes! So cute! 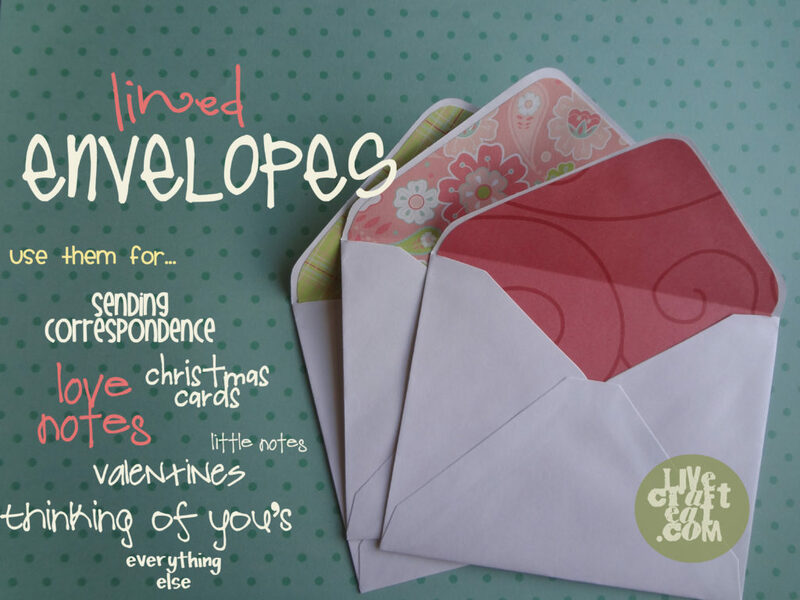 I never thought of lining envelopes I already had! What a cute idea! I’.ll be sending some of those out! These are so cute. I have a question, though. 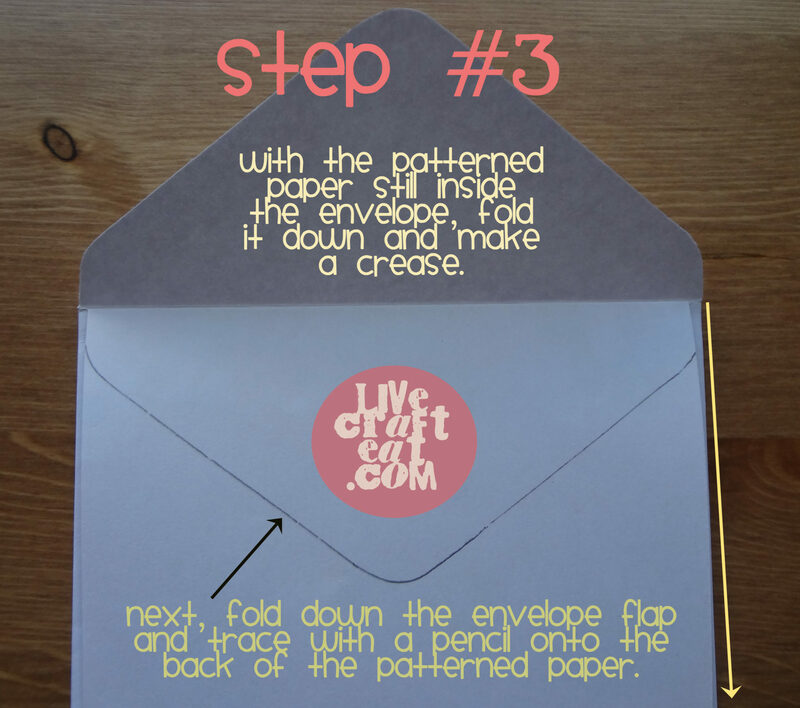 Do you cover the sticky part that seals the envelope?if so, how do you seal the envelope? Great question, Tami. I covered the seal on my envelopes because I was going to use stickers to seal them. But you can certainly cut your paper a little short on the top so that you still have access to the seal. Or, you could just use glue to seal them, if you wanted to go that route. Hope that helps! Thanks for visiting my blog! Great! Thanks for the info, Judy! !